Before a standing-room group of residents and several members of the Long Island Motor Parkway Preservation Society, the Town Board of Hempstead unanimously denied a petition to rezone a Levittown property for two-story 46-unit condos on the site of the Vanderbilt Cup Races' grandstands and press box from 1908 to 1910. Aproximately 40 people spoke against the rezoning and five people in favor. I presented a history of the Motor Parkway and Vanderbilt Cup Races on the property and the efforts of Nassau County to make it part of the Motor Parkway Trail project. After the hearing, William Cohn, the attorney for the property owner, commented; "It was disappointing and we would have to look in the future for alternative solutions" such as the county purchasing the property." The developer sought re-zoning on the Levittown site to develop two-story, 46-unit condominiums. 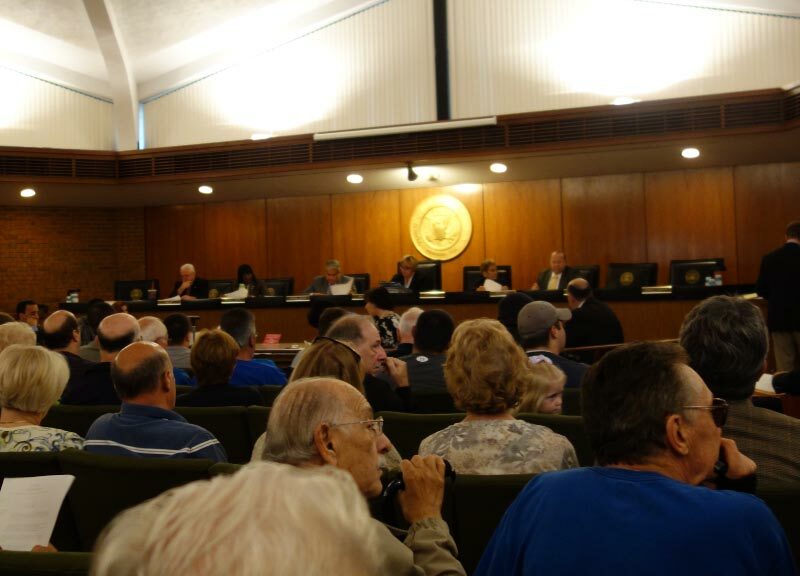 The Town of Hempstead announced at a meeting Wednesday that the board has denied a developer's request to re-zone a property from single-family home zoning to a condominium/multi-family zone at Crocus Lane between Orchid Road and Blacksmith Road in Levittown. The zoning that was sought by the developer would have changed the current single-family zoning (LRPD) to condominium/multi-family zoning (CA) for the Crocus Lane site, to construct a two-story 46-unit condominium development for residents aged 55 and over, but after listening to concerns from residents and hearing their testimony, the board decided to shut down their plans. Among the concerns brought up by residents was the potential increase in traffic, the project not fitting in with the character of the neighborhood, the desire to preserve the land, which is also located on the former site of the Long Island Motor Parkway. “As America’s first suburb and a bedroom community to the largest city in the world, Levittown maintains a special character that its residents love and cherish,” said Town Supervisor Kate Murray. “It was determined, after thoughtful analysis and consideration, that development within the requested zone parameters would not fit the suburban character of the neighborhood surrounding the property," Murray said. One of the biggest issues raised with the project at the meeting Wednesday was the fact that the complex would have been located in the middle of residential homes. Attorney William Cohn and other representatives compared the Crocus Lane project to four current 62-over housing developments in the area - but Crocus Lane site is not within walking distance to commercial and transit, and the four examples given are "each located on major roads," said Councilman Gary Hudes. “It literally does not fit – the proposed project is too dense for the area,” Hudes said in a statement. The Nassau County Planning Commission, which submitted a resolution to the town board in regard to the developer’s re-zoning request, also recommended the denial of the application. In its resolution, the Nassau County Planning Commission noted that the plan did not fit in with the single-family character of the neighborhood, nor did it meet the commonly accepted criteria for age-restricted development, according to a statement. “As Levittowners who seek to protect the beloved character of America’s first suburb, and as representatives in local government, we are standing up and saying “NO” to this ill-conceived and poorly thought-out proposal,” Murray said. A plan to build a 46-unit condominium complex on vacant land in Levittown that once was part of the nation's first superhighway has been rejected by the Hempstead Town board. The town board Wednesday voted 5-0, with two absences, against the proposed project by Crocus Lane Estates Llc and Josato Inc. to build housing for residents 55 and over. The developers were seeking approval to rezone a nearly 3-acre parcel on Crocus Lane between Blacksmith and Orchid roads from single-family housing to allow the condo complex. "The application . . . has been denied," Town Supervisor Kate Murray said after the nearly five-hour public hearing, prompting some residents in the audience to cheer and clap. More than 200 people attended the hearing. Before the public portion, Councilman Gary Hudes polled the audience, with about two-fifths expressing support and three-fifths in opposition. During the hearing, Hudes and Murray pointed out the area's history as single-family homes. Hudes also mentioned a Nassau County Planning Commission report that the project's approval could set a precedent for "spot" zoning. "We're thrilled with the decision," said Levittown resident Mary Voulgaris, 54, who spoke against the proposal. "I hope this never comes up again. As a community, we come together to fight for a cause and this is the result." The proposed complex -- on a site that is part of the former Vanderbilt Motor Parkway -- would have included three two-story buildings with 123 parking spaces, said attorney William S. Cohn, who represents Crocus Lane Estates and Josato. The mostly two-bedroom condos would have sold for less than $300,000. "It was disappointing and we would have to look in the future for alternative solutions" such as the county purchasing the property, Cohn said. Crocus Lane Estates and Josato, formerly called Terra Homes, have been battling since 1984 to change the town's zoning laws so they could develop the property. Opponents said the proposal would destroy the community's residential character, create a fire hazard and cause more noise, traffic and parking problem. Among the opponents was Levittown Property Owners Association president James Morrow. "There is no justification for the zoning change," said Henry Luhmann, 58, who has lived in Levittown for 27 years, adding the developers should build two one-family houses instead. Supporters of the project argued that more senior housing is needed, it would create construction jobs and bring additional tax revenue to the school district. 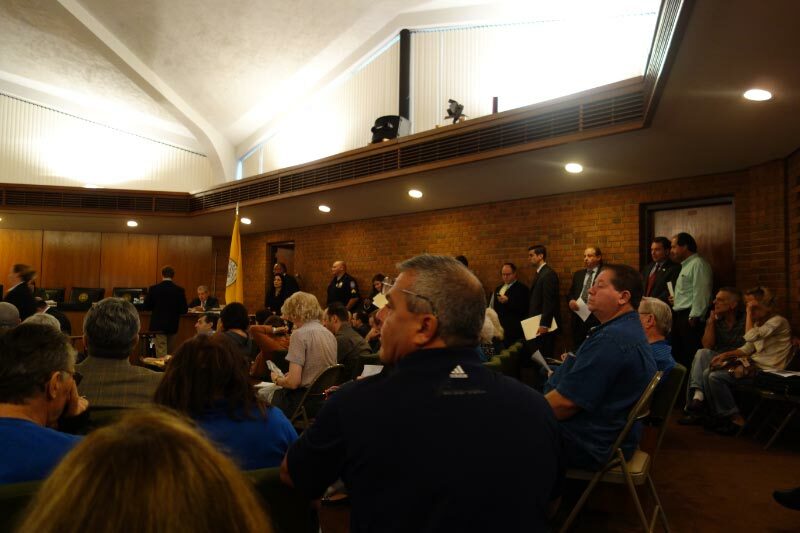 A packed crowd at the Town of Hempstead town board meeting on Wednesday. The town decided to shut down a developer re-zoning request. Thanks for sharing you are really doing a wonderful job. The good guys win one for a change. Keep up the good work. It was a pleasure to meet you at the Town Board meeting and thank you so much for your presentation, I saw how Kate Murray examined your photos, she seemed impressed. 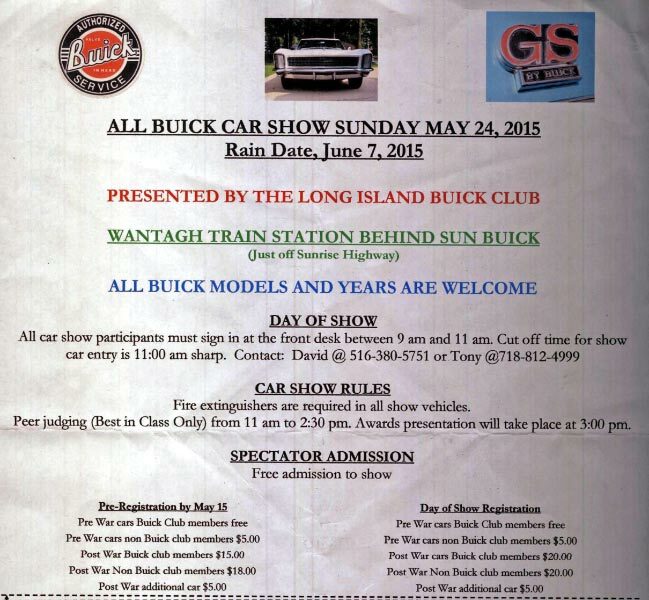 Great job, your support is greatly appreciated. Great job, maybe one day the lot could become a park and let the community enjoy it again. I am proud of myself and the other LIMPPS members who sat for hours before being able to publicly speak at the hearing. We all received standing ovations . Our words obviously meant something. We are a great club and are always ready to help out. Great work everyone.